Hey guys. So everyone on here is like, old now? Yeah. OH MY GOODNESS!!!!!!!!!!!!! Sleepover Fanatic! How are you? What's going on? So happy to see you back again! If you want this topic pinned, please let me know and we can make this your special topic. *glomp* Welcome back! I guess I'm a little more "older" now as I'm in my first year of college. How about you, how has you life been progressing? Yeah I'm a sophomore in high school, pretty fun, I'm in our school's tv station. You know what I forgot about this board, because no other board has it? Really long signatures. I think mine's like, 3 years old now. I think I need to change it. You know what, I'm gonna try to get back on here more. It's way less active than it used to be, but there's still some awesome people sticking around. Also, my screenname makes me laugh. It was my first screenname ever, I came up with it in 5th grade. But I like it, even if it's dorky. It's like me. Great seeing you again! Hope you do stick around. If you decide to follow a career in television, FedEx has one of the best television stations in the country! Yes, a real television station. The only way you would be able to view the FedEx station is to be an employee. It's great to hear that you do not spend time planted in front of the tele. Wow I didn't know that! But I'm hoping on going more of the movie way. When HampsterKing did an update, people lost numbers. I will let him know that you are missing a bunch. If you remember about the number you had, I will have him restore your number. ^Naw I don't remember, it's all good, though. You could always venture up to HampsterDance Talk and look up my topic the Horatio Club topic. a plethora of magnificent photographs. But that was when it was really, really short. It only took you about 10 minutes. Did you like the motorcycle pictures? Did you like the frog? The frog fit really well on the back of my bike! How wonderful to see you again, SleepoverFanatic52!!! We have a new policy for all those people who agree. Go to Warm Wishes and look for the topic called IMPORTANT TOPIC... EVERYONE PLEASE READ. should have no problems with the rules. If you agree, please make a post that states you will abide by the rules and I will have you approved. Oh cool! Ima go do that now. Well... last day of high school! Off to college. What a great surprise!!!!! How are you? What college are you attending? How was graduation? Hope you are excited about going to college. I think you will really have a great time. Please stop in again and fill us in on what has been happening. It is always great seeing you!!! Graduation was... long. But fun, I suppose. I hope I will have fun in college! I mean, I know I will, but it's hard to imagine because I really have no idea what things will be like. If you feel comfortable saying, you are permitted to tell us what college you will be attending. And if you choose not to, can you at least tell us what state the school is located? What area of subjects do you think you might focus your studies? Have you already selected a major to pursue? Don't worry if you change your major a few times. The best thing is to get the required subjects out of the way first, this will give you more time to think about what you want to do with the rest of your life. 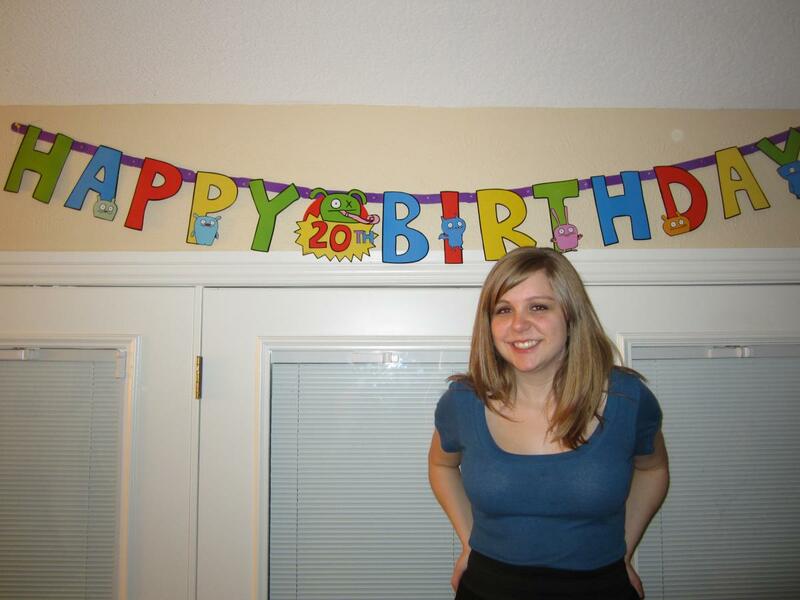 Also, because you turned 18 on the 18th of March, you are permitted to post pictures of yourself. So, we would love for you to post some pictures!!!! I was being nostalgic today and decided to stop by. I can't believe I signed up for this when I was ten and now I'm twenty. I'm really glad to see some of you guys still here. When this place was really popular hanging out here was one of my favorite things to do. Then the place where I was using internet blocked the site and I couldn't get on for about a year. When I finally got internet in my room I came back, but I missed this place that whole time. To answer the questions from a few years ago I never answered... I'm a film major at TCU. I love it a lot! WOW!!!!!!!!!!!! I am thrilled to hear from you! Congratulations at your college and being a film major. LifesEagle would be thrilled to hear the news as she changed her major to film a couple years ago. Please do stop back and visit. You can always post a picture of yourself. There is lots and lots of news. Later for this. Thank you, thank you. I will look around on my computer for a picture. My intention is to stay here this time. I certainly hope so. We really enjoy hearing from you. Yep okay I found some with just me so you're not confused as to which person I am. 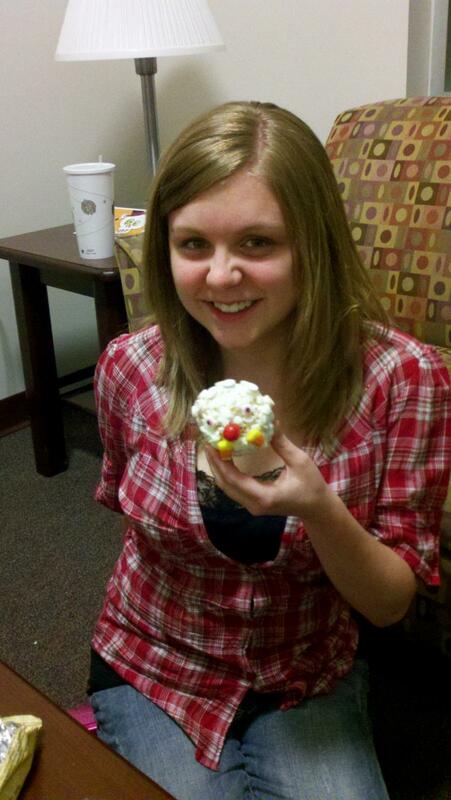 This is me with a popcorn ball on Halloween! You are soooo pretty! Thank you for the picture!!! A popcorn ball? It looks like the size of a cupcake! I have never seen one of those before. The face is really great!!! Did you create the face? Aww thanks! You've never seen a popcorn ball?? This one wasn't that good because it was from a kit that was ordered from an online popcorn company and sent to me and my roommates. My parents sent it to us. We all decorated them on halloween. My mom made them a few times when I was younger and they were way better. It's like popcorn and marshmallow and butter. I am great at procrastination. Why do something important when you can play Pocket Frogs. Never EVER ever ever ever start playing Cookie Clicker. And why not??? Are you hooked??? PocketFrogs is my addiction! I'm not even allowed to play anymore since my roommate and I got into a competition that lasted like two weeks. LOL... I would have loved to see you two in the comptetition! That must have been hilarious. How are you? Did you have a nice holiday? Please keep us up to date with what is happening!!! I just tried to get on the boards and I got an error message at first - I thought I had last you all forever! Oh no! I would never let that happen! We have to be here for the occasional surprise visit from people such as you! How are you??? What is happening? How is life treating you? What are you doing these days? Please let me know! Hahah hi! I'm pretty good! I graduated college in May and had a summer job, now I'm just trying to figure out what to do! Oh my goodness! You graduated already! What was your major, degree in and were did you graduate from? What is your summer job like? Talk to me!!!!! I am so, so excited!! !